While we are generally permissive for educational use of our content, we assert copyright protections for commercial use. This website contains considerable creative content about the 2017 eclipse that is not available on any other website. 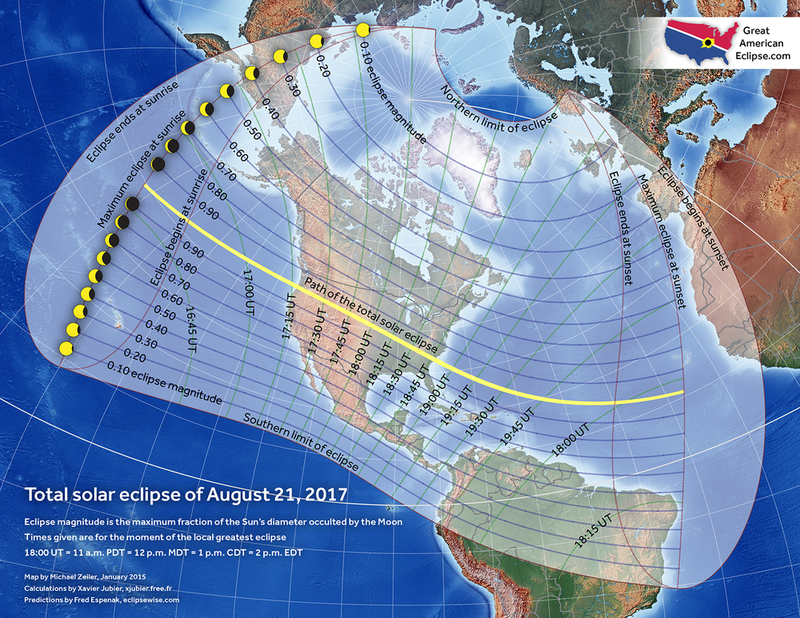 The majority of the maps and graphics throughout this site are under copyright and are the original creation of Michael Zeiler, one of two principals behind Great American Eclipse LLC. If you are a private individual who wishes to print content for private use or share content on social media, we are fine with that. Please do not modify our graphics and we'd appreciate a link to www.GreatAmericanEclipse.com on social media posts. If you operate a website or blog, you may quote up to a couple of paragraphs and use up to three graphics on your site. All graphics that are used cannot be modified and must be accompanied by a credit to 'Michael Zeiler, www.GreatAmericanEclipse.com'. Email us if you wish to use more content. If you are writing a book or magazine article, please send an email to greatamericaneclipse@gmail.com. Please state which content you would like to use and how. If you need custom maps or wish us to remove our logo, we generally require a fee. We can provide higher-resolution images for much of our work. We are generally receptive to sharing our content but want to understand how you will use our content. If you are a hotel or person wanting to rent your house for the eclipse, we are not a clearinghouse for rentals but we will take ads for hotels on our respective state page. Email greatamericaneclipse@gmail.com. If you are an eclipse tour operator, you can use content up to a limit of three of our images with a credit to this website. Will we throw you a link? Nope, our philosophy is 'if you make a buck, we make a buck'. We'd be happy to offer an ad placement on the relevant page of our website, email us. If you are a teacher or represent an educational institution, we are very receptive to your sharing our content in the classroom. We strongly support education and the development of scientific thinking in students. If you wish to purchase maps, eclipse glasses, or similar for students, we offer a generous educational discount. If you are serving an underprivileged community, we'll send you a free map for your classroom. Email us at greatamericaneclipse@gmail.com. If you are a TV station, we can share animated maps we've developed in high-definition 1080p mode. We just ask for on-air credit. These animations are much too large to serve on our website so email us for details. Maps can also be used with an on-air credit. If you are a commercial enterprise interested in our content or merchandise, write us at greatamericaneclipse@gmail.com. We offer wholesale prices for most of the items on our store at www.GreatAmericanEclipse.com/Store. We can customize items such as our maps, books, and other. We sell bulk quantities of eclipse glasses customized for your business. We can provide items such as high-resolution maps for a fee. We can also sell ads, if relevant to the eclipse, on our website. Note that we have a trademark on our logo and the phrase 'Great American Eclipse' but we will consider a licensing fee for their use. If you are an astrologer, conspiracy theorist, or other type of quack, we would rather that you not taint our content with use on your website or materials. The theories of Newton, Darwin, and Einstein are correct. We reject anti-scientific nonsense and seek to promote the rational understanding of the unspeakable beauty of solar eclipses. - The bulk use of our maps and other content on a competing website. We've busted two people trying to clone significant parts of our website. - The modification of our maps and graphics, especially the removal of our logo and URL. - The use of any imagery credited to people besides ourselves. If needed, we can provide contact information for most external contributors. - The reproduction of any items that we sell, especially our maps, posters, and book. - The use of text content beyond what constitutes 'fair use' under U.S. copyright law. We judge this to be about two paragraphs. - The use of our trademark phrase 'Great American Eclipse' on apparel without a licensing fee agreement. - The unapproved use of our logo.